Star Trek Costume Guide: Men's TNG season 1 admiral pattern - now shipping! Men's TNG season 1 admiral pattern - now shipping! 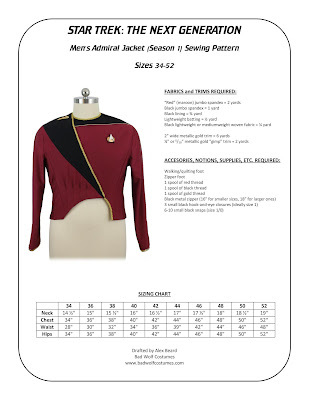 My new (Bad Wolf Costumes) men's TNG season 1 admiral jacket pattern is now shipping! A free sewing tutorial (intended for use with this pattern) is coming soon, so check back regularly and subscribe to my "Costume Guide" e-mail newsletter (upper right corner) for updates!